My plan is to make this into the front of a pillow. Its current shape is too long and narrow, so I would build it up on the top and the bottom and aim for a finished size of about 25×40 inches once sewn together. I bought some beautiful silk fabric to make the back with (and also a border across top and bottom). Since finishing the knitted portion I have been having second thoughts about whether using a silk fabric backing is a good idea, or whether I should knit the back. I sought advice from various friends in Vancouver (where I spent my Christmas holiday) and I also asked for advice in my last post. Both my friend Teresa (who was serendipitously also visiting Vancouver for the holidays) and my blogging friend Ann (who responded to the blog post) suggested using fusible interfacing to stiffen the fabric. I believe this intervention was intended irregardless of whether I ended up using a knitted or silk cloth back. Both of them felt that the knitted piece would be too flimsy to hold up in the pillow and should be reinforced. I am wondering whether the fusing will fuse, not to the knitting itself but rather only to the floats that are stranded across the back. Furthermore, as you can see in the top photo, there are two lines of text, and in between is about twelve rows or so of plain purple knitting in which I didn’t strand the yellow (there are also similar portions on the top and bottom of the panel). These areas looked quite different from the stranded ones pre-blocking with a slightly different gauge, causing some puckering, and also a smoother texture, as you can see in the below photo which was taken pre-steeking. In addition to wondering how the fusing will interact with the stranded fabric, I am worried that it will interact differently with the unstranded portions thus once again highlighting the distinctions between the stranded and unstranded portions that I managed to hide with a good blocking. 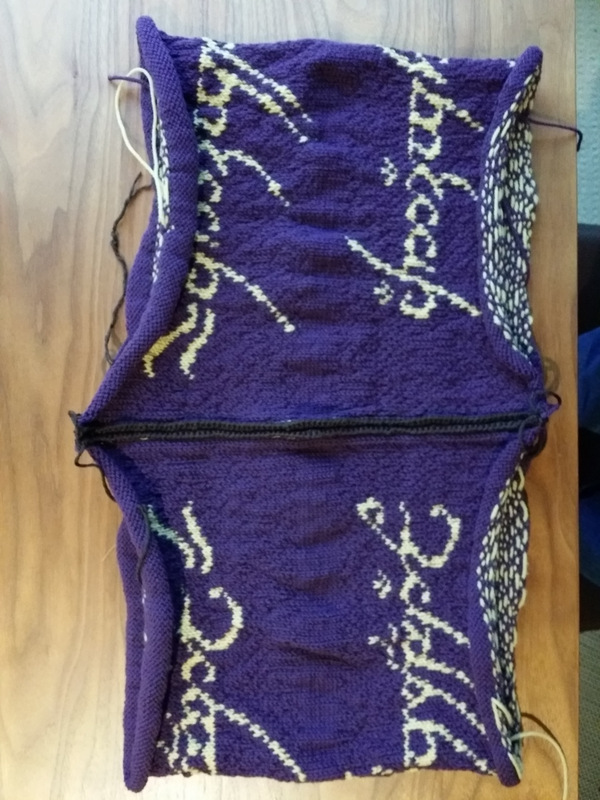 If anyone has experience using fusible facing on a stranded knitting project, I would love to hear from you. Also, to Lora, thank you for your lovely comments on my last post. I really do love the silk fabric I bought for the pillow back, and my main concern about using it is my lack of confidence and experience in sewing. I will definitely take your advice and consult a professional seamstress before I make any decisions. Well, I will stop musing about fusing now, and go back to musing about the Income Elasticity of Demand. Sigh…. This entry was posted in Main and tagged Crafts, Fusible interfacing, Knitting, LOTR, One RIng, One ring to rule them all by knitigatingcircumstances. Bookmark the permalink. hmmm, you raise some really valid points. I had also thought you would need to stiffen both the fabric and the knitting and have a very firm pillow. I wonder if there is an adhesive backing that wouldn’t need to be heat fused, just mashed so to speak. You may need to consult a shop that finishes needlepoint or needlework into pillows to see if they would have any advice. Thanks; the needlepoint angle is a good one. I actually have some needlepoints I want to get professionally stretched and framed, so perhaps I can kill two birds with one stone, so to speak. Hi Susan, I have definitely thought of this, and it is a really good idea (especially the bit about knitting it back and forth and breaking the yarn). I have lots of extra yarn, but am worried about the amount of fabric I have, however. So, I’m not sure I can practice with fusing the fabric as well as the knitting. If you remember I tried using a fusable mesh on the green mohair 3/4 length coat I made years ago-IT DID NOT WORK-finally just used a regular mesh and ended up cutting it completely out-I guess that I would not use a fusable material on a knit–as the knitted piece moves (even tho it is the top of a pillow) the fusable material may hold it too tight to allow the needed movement. Hi Mom! This is a very good point. I had completely forgotten that you had tried fusing on that coat. (For other readers, I wrote a post that featured this mohair coat, and you can find it here: https://knitigatingcircumstances.wordpress.com/2012/06/17/retrospective-knits-part-1/. The coat in question is the last knit featured in the post and I discussed the netting in the text. This is one of my all-time favorite posts, so if you’re new to the blog, you might want to check it out.) Thanks for the comment, Mom. Doing a test swatch is a great idea, but I also see the point about using a static mesh with a dynamic knit! I like the idea of a knit backing or a professional sewing the silk fabric. Either way I love the idea of a long, narrow pillow. Looks awesome on either a sofa or a bed. Nice work! Thank you, Gretchen. I had originally hoped for a more square-shaped pillow, but the long rectangle is beginning to grow on me. Hi Kate, I think you are right that a knit fabric would perhaps be more suitable backing, though I must say I am really enamored of the silk fabric I picked up for this project. I think the key here is to test a bunch of different options. Maybe yours will also hold up perfectly well without reinforcement. It looks amazing, by the way. OMG! This is GORGEOUS! I want to knit like you when I grow up! Oh, you have set my head spinning with ideas! Thanks so much for commenting and for the link. Ha ha! You’re so over-estimating me. To write so much in yarn is far more than I could manage. I’ve just had a further peek at your blog and discovered that you live less than 5 miles from me (as the crow flies)! Small world! Oh! Exciting! Can I ask where on a public forum? Or are you on Ravelry and we can PM? I’m Occles on Ravelry…. I have to clarify my previous comment. I would not put any fusible interfacing on the knitted front of the pillow, only on the fabric that makes up the back of the pillow. Your backing fabric has to be more stiff than what you currently have – it has to be give-or-take as consistent as your knitted front. Your starting point should be a muslin pillow filled full enough to comfortably span both the knitted front, and interfaced back. From this starting point, you can see just how much filling you’ll need in your pillow to accommodate your slipcover. Like The Twisted Yarn’s beautiful fern cushion, I’d add a decorative twisted cord that will hide the seam between knitted front and interfaced back. Wow, I ‘m really glad I put up this post because I completely misconstrued your last comment. Thanks for clarifying. And, yes, I will definitely be making a slip cover with a separate pillow for filling; I don’t think I made that clear in the post. As always, thanks for the comments, Ann. I agree about sewing a pillow insert rather than directly stuffing the knitting. The other thing I would do is line the front with a woven fabric that will have the same amount of give as the woven silk fabric in back. Stretch the piece of knitting to a pleasing tension and baste it around the edges to a rectangular piece of lining fabric. 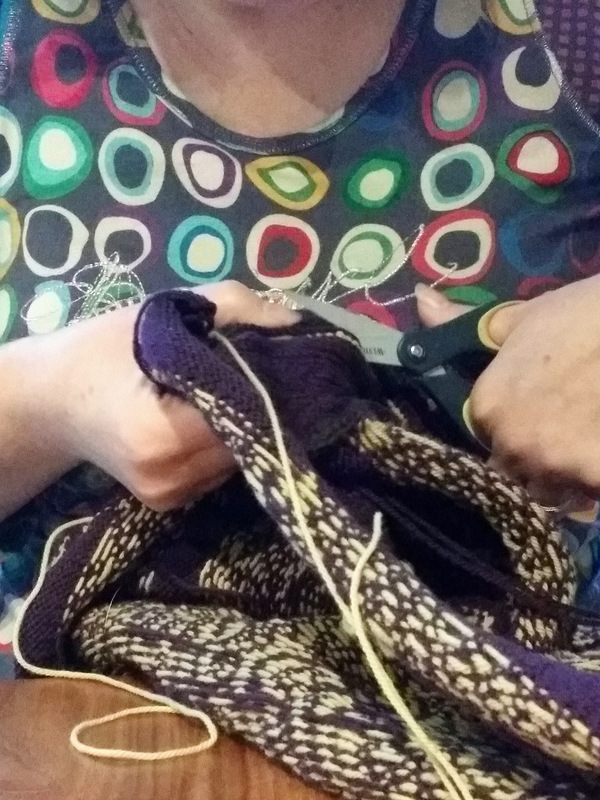 This will keep the knitting at whatever tension you set and will prevent stretching, sagging and lumps later on. Then you treat both pieces as one when you sew them to the pillow back. Now about the edges. I would use piping to keep a knife edge on the pillow. A flanged pillow would also be pleasing as it would give you an unstuffed edge of the silk fabric all the way around. Hope this helps! Thank you for your comments, Lynne. This gives me more to muse upon. Interestingly, I never even thought about edging treatments at all until I read the comments on this post. Now that gives me one more dimension to consider…..